The Corvette Action Center Supporting Members are a vital part of helping this community grow and improve. We would like to thank all of our members for their continued help and support. Supporting Members help offset the cost of operating the Corvette Action Center web site. With all the new upgrades and extra room planned, the cost to operate the site continues to increase. We've been able to keep the entire site free to members and non-members and will continue to do so. The Supporting Membership program is completely voluntary and not required for forum membership. It's a simple way to help support the site and provides you with a few extra membership benefits. Access to the Supporting Members only forum. 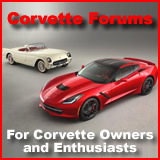 The ability to upload videos to the Corvette Action Center's Videos section. The ability to have up to 10 cars in the Garage Section. Save up to 300 Private Messages. Larger signatures with more images and videos. The cost of Supporting Membership is $26.00 per year. To become a Supporting Member simply click on the "Settings" in the forums tool bar, then scroll down the left column to "Paid Subscriptions" on the left and click on it. Simply follow the instructions from there. Please be sure to include your forum username on your check or money order. If your forum title has not been changed to "Supporting Member" within 7-days, or if your online payment e-mail address doesn't match the e-mail address you registered with, please contact us with your forum username and online payment e-mail address. Thank you! The legal stuff - While we do the best to provide 24/7 service at the Corvette Action Center there is no guarantee of continued service. Supporting Members must follow all forum rules just as non-supporting members. Supporting Member status does not grant any special consideration when member banning is considered due to breaking forum rules. Refunds will not be granted to Supporting Members who are banned for breaking forum rules.